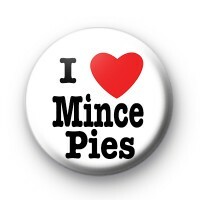 Christmas themed I Love Mince Pies Badge. Mince Pies are one of my favourite Christmas Traditions So why not pin this fun 25mm festive badge to your coat and declare your love for the humble but delicious Mince Pie! Our handmade 25mm Christmas badges look so good pinned to your jumper, bag or coat during the festive season. With over 500 Xmas designs to pick from, we have the perfect Festive badge for everyone.